Color Pop Pro is a point scoring puzzle app. 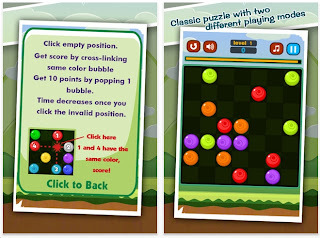 Click on a square that connects horizontally & vertically to same-colored balls. They will disappear, you will score points and you are given a strict time limit. My high score after playing for about 45 minutes is 4152. I'm in the top 5%. However, the high score is 24,000. Color Pop Pro is a free and fun puzzle app.